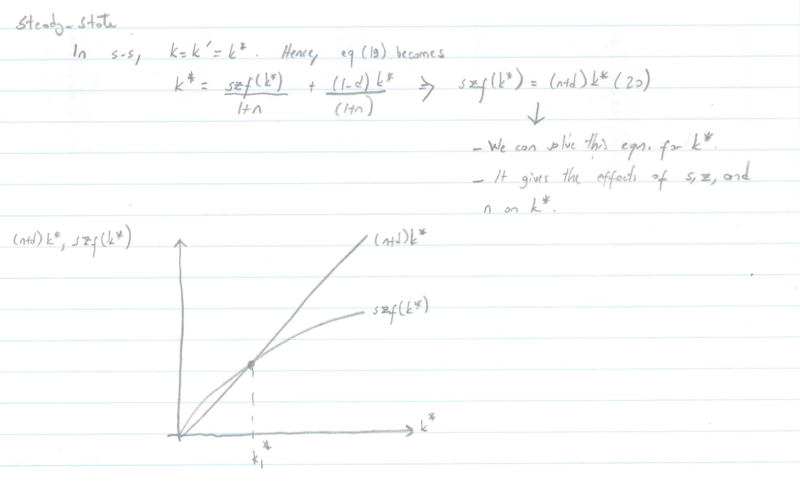 my lecturer is doing a rather poor job explaining what he's written down, so I'm wondering if someone would be able to explain the following graph for me? This is a part of the Solow-Swann Growth Model lecture for Macroeconomics, and he's talking about the equilibrium that this model predicts, k stands for capital per worker, s is savings rate, z is technology, d is depreciation rate, n is population growth rate. My confusion is with the Y axis. How does an axis represent two equations..? An axis is characterized not by the variable it measures, but by the unit of measurement. So an axis can measure any number of variables, as long as they are measured in the same measurement unit. In your case, the unit of measurement is "units of output", and both $(n+\delta)k$ and $sf(k)$ are measured in it (capital is measured in units of output, in case you wonder). Not the answer you're looking for? Browse other questions tagged macroeconomics steady-state or ask your own question.